Sports Reporter Craig Turnbull gives his verdict on an enthralling Scottish Cup tie between Falkirk and Stenhousemuir. 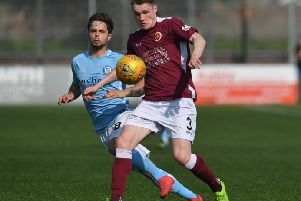 Montrose, Queen of the South, Connah’s Quay Nomads ... you can now add Stenhousemuir to the ignominious list of chastening defeats Falkirk have suffered this season. Take nothing away from the Warriors, they deserved to win this pulsating Scottish Cup tie – the first time they have won at home to Falkirk since January 1936. However, this does not hide a desperately poor display from the Bairns and just when you think it can’t get any worse it does. Perhaps the most galling aspect was that boss Ray McKinnon had worked hard on shoring up the defence. But they were abysmal here. Did the late enforced change before the game, with Aaron Muirhead replacing Scott Harrison affect things? It doesn’t matter. Falkirk should have had more than enough to overcome the League One outfit. McKinnon said Falkirk thought they were Barcelona in the first half the way they were playing out from the back. Tongue firmly in cheek of course, but, not even Lionel Messi would have saved them here. The Bairns have got by in recent weeks just doing the basics because this side have demonstrated all too often this season that to ask any more than that is simply too much. Against Ross County, Dunfermline and Partick Thistle it wasn’t pretty, but they were stubborn and difficult to beat. However, that layer of resistance was stripped away mercilessly by a part-time side that were much better as a whole than the sum of its parts, and Falkirk’s fragility, laid bare for all to see in front of a 1500-strong travelling support. There was a carnival atmosphere in the away end before kick off and the volume was raised when Paul Paton opened the scoring, but if they thought they were going to be in for an enjoyable afternoon they were sorely mistaken. Stenhousemuir rallied and seemed hungrier and more determined. They were rewarded with a quick-fire double from Conor McBrearty, the on loan St Mirren defender, showed more appetite and desire to win two headers inside the six-yard box to turn the game on its head. He only turned 18 in September and proudly proclaimed he was going to get “full of it” afterwards and you get the feeling a few stiff drinks would have been had by Bairns fans too. For all of Falkirk’s shortcomings it made for an enthralling Scottish Cup tie. Back came the Bairns and they levelled before the break through Joe McKee. It would have been expected that the Championship side would go on to stamp their authority on the match after their early scare, but the Warriors had other ideas. They seized the initiative and grabbed the third goal. From a Stenny point of view there was real quality about their goal which arrived on 59 minutes as Sean Dickson finished off a fine move, though Falkirk’s defence were invisible – quite a feat given they were wearing bright yellow. Mark McGuigan added a fourth with a composed finish easily brushing off Patrick Brough to shoot past Leo Fasan and set up a tie with Aberdeen. Credit to Stenny but this fixture could be a more common occurrence if Falkirk don’t get their act together and fast.